All woodwind instruments are vulnerable to some extent because of their fragility (especially at the tenon joints) and also because of the moisture created by the warm air being blown through them. The wood must be oiled regularly to help keep it from drying out completely and cracking. Regular playing helps a wooden flute develop a mature 'voice' – just as regular playing helps a flute player to develop and maintain a good embouchure. Martin Doyle offers the following guidelines for the care and maintenance of wooden flutes and also some instructions for 'playing in' a new flute. 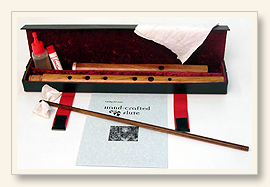 There is also a download PDF version of Wooden Flute Care at the bottom of the page. Keep the instrument at room temperature wherever possible and avoid extreme heat or cold. Try to avoid very dry conditions and do not leave a wooden flute in direct sunlight or near a source of heat. Lightly oil the bore every couple of weeks using bore oil or almond oil. Use cork grease on the tenon joint/s at least twice a week or whenever the flute becomes 'sticky' to assemble. Using a wooden bore rod threaded with a piece of rag, mop out the flute after playing to remove moisture. It is also good to let the flute dry thoroughly on a stand or in an open case after playing. When not in use, disassemble the flute to take pressure off the tenon/s. A wooden flute can be cleaned externally using almond oil and then wiping it dry. Cotton wool buds (Q-tips) are excellent for cleaning embouchure and tone holes. It is also good to remove any built up cork grease from tenons and sockets occasionally. It is generally recommended that wooden flutes be played in gently when new. Start with short sessions (10 to 20 minutes) twice a day and increase the length of the session as time passes. After a few weeks, the 'voice' of the flute will begin to develop and the flute can be played as much as the owner wishes. Apply the philosophy of a child learning to crawl, walk and then run – the process takes time and requires a little patience, but the results are great! Click on the image below to view / print / download a PDF version of this page.